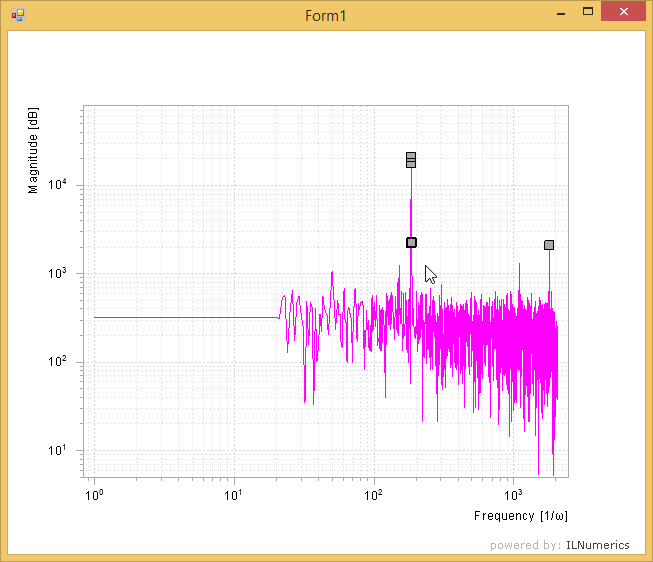 A simple Spectrum Analyzer is created. It records chunks of audio from the local computers microphone using the NAudio library. The signal is than preprocessed (windowed) and analysed efficiently and in real time using the ILNumerics Computing Engine and its FFT capabilities. The resulting spectrum is displayed continously in a form with a line plot. Peaks at maximum magnitude are found and emphasized with markers. The signal is shown in a logarithmic plot with frequency / dB scale. The plot is getting updated frequently but remains its interactive capabilities nevertheless.